Beer and Tacos. There are some people who aren’t privy to beer, but I have yet to meet someone who doesn’t get down on a taco every now and then. When approached to do a guest post for October Unprocessed, I wanted to make a recipe that represented the epitome of my food philosophy – fresh, local, organic, yet still appealing and hearty enough for meat lovers. I wanted to stay away from meat because more and more people, including myself, are leaning more towards a plant-based diet these days (meatless Mondays, anyone?). But above all, it had to be unprocessed. 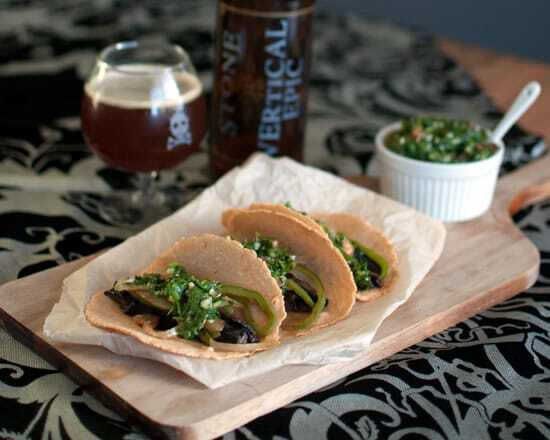 I racked my brain, and finally Blonde Ale Portobello Tacos with Chimichurri manifested themselves. For the past year, I have been an enthusiastic home brewer. If you haven’t tried it, but are interested, go for it! It’s very rewarding, especially when you finally get to drink your creation. 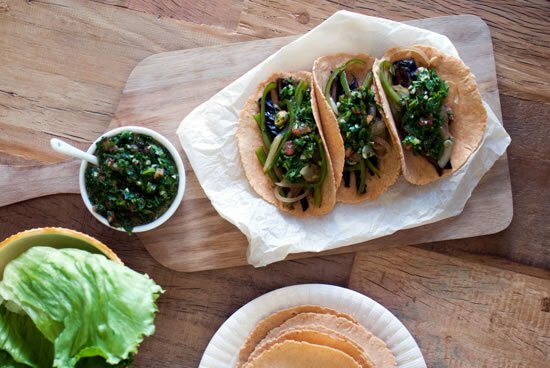 Recently, I brewed a clone of my favorite beer ever, and couldn’t pass up the opportunity to incorporate it into these tacos – especially after reading #Unprocessed FAQ: Beverages. Very fitting. If you aren’t a home brewer, don’t fret! Any blonde ale should do the trick for this recipe. It will go exceptionally well with the breadiness of the tortillas, and the earthy notes of the portobello mushrooms. A pilsner, brown, or wheat beer would also work well with the flavor profile. Since we are in the midst of October Unprocessed, making tortillas was a must for me. My homebrew was lonely in the fridge, so I incorporated it into the tortillas. 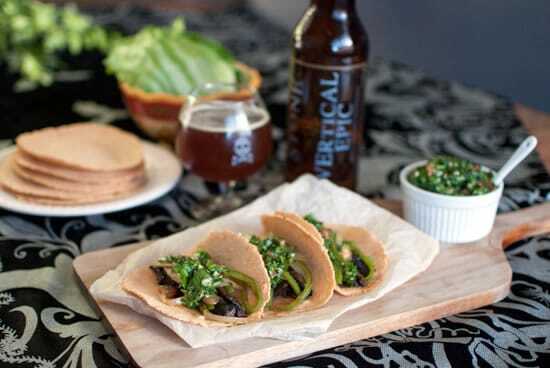 You certainly don’t have to put beer in your corn or flour tortillas – you can use water instead, but in order to make them more appealing to the beer-loving masses, I decided to add it in. To make the tortillas, you’ll need a few tools: a tortilla press, and a freezer bag. I cut the freezer bag slightly larger than the size of the press, leaving the folded edge of the bag intact. The thicker plastic makes it easier for me to press the tortillas without getting pesky folds in the plastic, and also seems to be easier to remove them and get them in the hot skillet for toasting. The ingredient list includes masa, beer, salt, and because I can’t leave well enough alone, I added paprika. It lends a hint of smokiness to the corn tortillas that will eventually swaddle the mushroom filling. Making your tortillas is very easy, and they are exponentially better than store-bought. The store-bought versions almost always have some weird ingredient in them, especially (and ironically) the “artisan” varieties. The meaty portobello mushroom is the star here, full of texture and earthiness. It’s painted with a mixture of boozy chimichurri, olive oil, and red wine vinegar, then grilled to meaty perfection. The co-stars are caramelized onion and hatch chiles. Top the fillings with an herbaceous and bright chimichurri sauce, and you have yourself a great, healthy, hearty, unprocessed meal. If you can’t resist the hot sauce (like me! ), be my guest, just be sure to read the label. If you want to go an even lighter route, wrap the filling in some big, crispy iceberg lettuce leaves. This will save you the time of making those tortillas too! Win-win! The meaty portobello mushroom is the star here, full of texture and earthiness. It’s painted with a mixture of boozy chimichurri, olive oil, and red wine vinegar, then grilled to meaty perfection. First, heat a cast iron skillet or flat top over medium-high heat. Cut a freezer bag to fit slightly larger than the size of your tortilla press, leaving the folded edge intact. Mix together the masa, beer, sea salt, and paprika, then divide the mixture into sixteen golf-size balls. To do this, I pat the mixture down in the bowl, and using a sharp knife, cut the dough into fourths. Shape each fourth into a log, cut into four equal pieces, then shape into balls yielding 16 balls of dough. While working the tortilla press, keep the remaining balls under a damp cloth so they don't dry out. Press each ball between the layers of thick plastic, then carefully peel the plastic off the pressed tortilla. Transfer to the skillet, and cook each side about 30-50 seconds, until the tortilla sets, and is faintly golden in spots. When the first side is set, it should flip over easily and shouldn't tear when doing so. Repeat for the remaining balls, keeping the finished tortillas under a warm, damp towel until ready to use. Mix all of the ingredients for the chimichurri in a medium bowl and set aside. Mix two tablespoons of the Chimichurri, olive oil and red wine vinegar in a small bowl, and set aside. Heat an outdoor grill to medium heat. If you don't have an outdoor grill, you can use your broiler, or a 400ºF oven. Paint the mushrooms with the mushroom baste, and grill for 5-7 minutes on each side, or until the mushroom is golden brown and cooked through. Remove from heat, and allow to cool slightly on a cutting board. While the mushrooms are cooking, heat a tablespoon of olive oil in a skillet over medium heat and sauté the onions and Anaheim chiles with ½ teaspoon salt until slightly caramelized, about 10 minutes. Stir about every two minutes so they don't scorch. 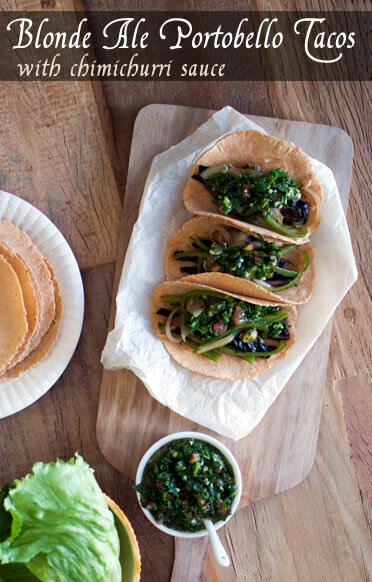 Slice the mushrooms into ¼ inch thick strips, and divide among 12 warm tortillas. Top the tacos with the onion/Anaheim chile mixture, and the chimichurri. Serve with hot sauce, a simple salad, and a nice blonde ale! Natalie Wiser-Orozco is a computer scientist by day, and recipe developer, photographer, and writer for The Devil Wears Parsley by night. She uses the website as a platform to “feed your inner rock star,” which means nourishing yourself with awesome, organic, local, fresh, whole foods with the occasional indulgence, so you can continue to rock at life! Follow Natalie on Facebook and Instagram. My mouth is watering! I’m trying these for sure! Let us know how they turn out, Victoria! This looks incredible. Thank you both for sharing! !